When my husband and I were married for two and a half years, we decided to start trying for a baby. We always knew we wanted kids, but we anticipated having to try for a while before it would actually happen. Much to our surprise, we got pregnant the first time we tried. 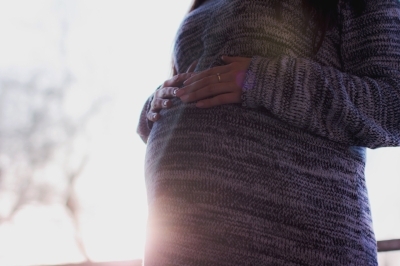 The Thursday before we found out I was pregnant (about one week after ovulation), I woke up in the middle of the night feeling sick and thought to myself, â€œWhat if I am pregnant?" The days passed, and I kept googling â€œpregnancy symptoms ð�‘¥ days past ovulation.â€� I was feeling every symptom in the book. On Sunday, May 14thâ€”Motherâ€™s Day in the U.S.â€”we came home from church and I found out my best friend was pregnant. We took it as a sign that maybe I could be pregnant (as my period was not supposed to come until the following week). The pregnancy test confirmed I was pregnant really, really quick. I jumped out of happiness (and shock), and my husband cried tears of joy. We both got down on our knees and prayed. What a miracle! We were going to be parents in January. The pregnancy was amazing, I was feeling a little nauseous, but not too much. I hated avocados, and loved limes. We saw the baby and heard its little heartbeat (165bpm) on June 14th, 2017, at exactly at eight weeks, on my husband's 30th birthday. Best. Birthday. Ever. I had previously been diagnosed with uterine fibroids. The doctor checked them and told me, with confidence, that everything seemed perfect. After 12 weeks, most women start feeling better, I didn't. I was still sick, and after the 13th week I was no longer feeling like myself. Now that I know the facts, I know that around the middle of week 13 is when I caught an infection in my uterus. Much like infections of the urinary tract or kidney, or any type of infection, this was unexpected and unavoidable. The cause is still unknown. In retrospect, I was feeling â€œa little under the weatherâ€� and had some lower back pain and possibly a low fever. I blamed it on the hormones and my fibroids. The week of July 24th to July 28th was the darkest week of my life. After a rough weekend (I worked on Saturday, and we had a busy Sunday), I started the workweek on a bad note. On Monday (the 24th), I could not sleep all night because I was having lower back pains. I blamed the fibroids. On Tuesday, I woke up from another bad night and had to take a quick warm bath to feel better. I threw up my breakfast and could not keep any food down the rest of the morning. Turns out, I was in labor. I pushed through and made it to work on Tuesday, July 25th. I couldn't stand up, I couldn't sit down. I was in a lot of pain. My boss told me to go home, and my husband picked me up at work. Looking back, I know now those were all signs my body was going into labor due to the infection. I got home and took a shower. It was the only thing that made me feel better. I put my pajamas on and took a 1.5 hour nap. My husband woke me up to serve me some lunch, since I wasn't eating, and he was concerned. I got up from the dining table because I was feeling uncomfortable. We went to the emergency room and had a nightmarish experience. We had to wait. They didn't take me into the labor and delivery triage because I was â€œonly 14 weeks.â€� The waiting room was packed, and I was desperately calling my doctorâ€™s office, and no one picked up. After what felt like an eternity, they finally took me in. They took blood work and a urine sample. At the time I collected the urine sample I did not see any blood, but the liquid kept coming out. The absence of blood kept my hopes up. We saw our baby on the ultrasound, with a heartbeat of 115. The ultrasound technician didn't say anything, but we saw our baby die. We saw our baby's heart stop beating. This was later confirmed by the doctor. After my ultrasound, I needed to use the restroom. I went, and saw I was bleeding. It was, at that moment, when I knew my baby was gone. After hours of waiting, and going back and forth waiting for the results (even though I knew them), we were taken into a room. They gave me the hospital gown to change into, and immediately started antibiotics. I did not think anything of it. A few minutes later, the doctor came in and said those words no parent wants to hear: â€œIâ€™m sorry, I do not have good news. We did not find a heartbeat.â€� We wailed for a few minutes. Then I spoke to my doctor on the phone, and she informed me of the infection. She said that was concerning, and that was the priority. She said I was going to be put on antibiotics, and the next day the induction process was going to begin. I was not given the option to undergo a procedure called Dilation and Curettage (D&C) given the conditions of my fibroids and how far along I was. However, due to the infection, it was necessary for everything to come out while leaving the uterus intact. I was in a very delicate condition. At that moment, I didn't want to see the baby or find out the gender. However, after talking to my husband and my mother in law, we decided to meet â€œitâ€�, and find out the gender. We didn't have a name for a boy, as we wanted a girl, and all of the old wivesâ€™ tales pointed to a girl. I was confused and sad; I was scared of meeting the baby, of thinking it was ugly or disappointing. The darkest night of my life began. They took me into a room in the Family Birth place, the same place where live babies are born. I cried the entire time. It was not fair, why did I have to see all the pictures of the beautiful babies hanging on the wall, while I was going to deliver a 14-week fetusâ€¦ not fair, just not fair. I was taken into a beautiful, quiet room. My husband crawled into bed with me, and my mom tried to sleep on the couch. No one slept. I was dreading four in the morning, the time I was scheduled to go to the other room and start the laboring process. I remember constantly telling my mom, â€œI am scared, Mommy." Now that I am a mom, I can imagine the pain she was going through. Suddenly, it was Wednesday, July 26th, and four in the morning came faster than expected. I knew we were about to face the hardest moment of our lives, and I was right. I just did not know how much love I was about to experience, as well. They wheeled me into the Labor and Delivery room. Yes, just like you picture it, a huge room with two couches, a birthing bed, a neonatal bed, and a picture of a father lovingly holding a newborn. I remember burning with anger and asking the nice nurse, â€œAre the pictures and the neonatal bed really necessary?â€� She placed a pillow to my left to block the picture hanging on the wall. The room had a small pillbox window I could directly see from my bed. At around 4:30 in the morning I saw a white dove, perched on a windowsill just outside. I told my husband I wanted to name the baby Noah if it was a boy, in reference to the bible story of Noah. The dove meant God was with us in this storm. At this point we still thought we were having a girl. At five in the morning, they put the first dose of Misoprostol in my cervix to start the dilation and labor process. I had been experiencing contractions all night, but after the pills, boy, oh boy, the heavy contractions started. I was not allowed to move for two hours in order to let the pills dissolve, and it was painful. My husband massaged my back, held my hand, passed me ice chips. All the things a father does. My mom did not leave my side. At nine in the morning my doctor came in, told me she was so sorry for what happened, and explained the procedure. I looked at her in the eye and asked, â€œWas it my fibroids?â€� â€œAbsolutely not,â€� she answered. She checked me and said, â€œYou are almost ready, itâ€™s going to happen soon.â€� She ordered another dose of the pills. She was concerned about the placenta not coming out, possibly leading to surgery. At about ten in the morning I felt a gush and some pressure. I called the nurse. She came and asked me if I felt like pushing. I said no, but I pushed anyway. The placenta came out first, and then my baby was born. There were fears of the placenta getting stuck and having to undergo a D&C procedure which, with the infection and my fibroids, would have been very dangerous. The fact that the placenta came out so easily was a miracle. They took everything from the bed and placed it on the neonatal bed, including the baby. I asked, â€œIs it a boy or a girl?â€� The nurse asked, â€œAre you sure you want to know?â€� My husbandâ€”who did not leave my side for one secondâ€”and I said yes without hesitation. She replied, â€œA boy.â€� We both smiled and said, â€œNoahâ€�. My husband then heard the name "Eliot" and asked me if Noah Eliot was a good name. I loved it. They carefully wrapped him in the baby blanket, just like a living, full-term baby. They placed him in our arms, and everyone left the room. Time stood still. I was holding my son. He looked just like daddy. His shoulders, his bone structure, his nose. He had little feet that looked exactly like his cousinâ€™s on my husbandâ€™s side of the family. I opened his little mouth and saw perfectly formed gums. We placed his hand on our finger, we talked to him, I kissed his blanket. My mom came into the room, held him, and fell in love as any other grandmother does. Noah was a fully-formed, perfect human the size of my hand. I could recognize my son among other 14-week fetuses. He is and will always be my first born. I don't know what I was thinking when I said I wanted a girl. I would do anything to have my little boy with me, to dress him up in bow ties and do all things boy with him. If God gives us more children, I can honestly say from the bottom of my heart I do not care what we have. We love you Noah Eliot, you made us parents. You came into our lives and left so quick, but you changed our world. I will never be the same, because of you. I never thought I could feel this much love for a tiny human, but I do. Looking back, I would not have had Noahâ€™s birth any other way. He had everything he deserved. I would have gone through the same baby-picture-filled hallway, same maternity room, same labor and delivery room, a thousand times to ensure that I, and the world, knew he was worth it. The experience showed me that his life was as important as any other living babyâ€™s. Copyright Â© 2016-2017 Stories from the Trenches, Inc.